Spring lasted all of a week, the temperature with wind chill is down to 0. All the little flowers that started to open up have been stunned into dormancy once again. This time last year we were in shorts and T-shirts! We wrapped up well and set off from Catford station to Otford with the promise of some blue skies and sun later in the day but knowing that we would be walking into the cold wind all the way. With noses running and eyes watering we headed out of Otford station and yes, uphill, just to get us warmed up, thankfully the ground was nice and dry so we didn't have any mud to contend with but the climb up Otford Mount was just as invigorating as Boxhill. Kent is not so flat after all! For once the views really opened out and it was possible to get a good idea of where we were heading with the line of Downs stretching out ahead in the distance. This 17 mile stage was definitely one of the best so far, the route clearly marked and despite a few hills the going was very easy, we didn't even mind the long sections through woods - thankful for the shelter they gave from the wind. It was surprising to see the number of trees that had been damaged by the hurricane in 1987 still lying where they had fallen, particularly those on the edge of woodland that would have taken the full force of the wind, some of the root systems pulled out of the ground were as tall as a bungalow. We then came across some really nice original stiles, normally Lizzie has a problem with stiles and finds them quite difficult to get over, there have been occasions when I have heard a thud and turned around to see her on the ground or in a bush. The top beam was engraved with the word 'LIFT', Liz thought that it was nice of them to give a bit of verbal encouragement as she clambered over the top, at the second set we realised that the intention was for you to lift the beam up and walk through, no clambering over and very easy. We were happy, particularly as there were quite a few of them! Almost half way through the day we entered Trosley Country Park and the very handily placed tea room. Fortified by a nice cup of hot tea we made light work of the flat trail through the woodlands which look like they would be amazing in a few months time when all of the bluebells are out, today however there wasn't much sign of life. Shortly after the park we passed the half way point of the whole walk and met a group of mountain bikers who suggested that we were kitted out for Everest, for once we were pleased that we were. After a conversation on the merits of hydration bags and what we did before they were invented we continued on our way. It is odd to think that we had to stop, get a water bottle out and have a drink when all we do now is carry on walking, drinking as needed on the go, can look a bit like a cyberman though with all the tubes dangling down. There are two ways to finish the North Downs, the shorter route turns south via Folkestone to Dover and is 125 miles long, the alternative heads north via Canterbury adding another 6 miles to make it 131 miles long. This means that there are two halfway points, however Liz has decided that she now wants to take the Canterbury route to Dover and then carry on going back on the Folkestone link before walking all of the way back again in the opposite direction. I just hope that she doesn't get the same idea when we are doing the Coast To Coast in June! As the Medway Valley started to come into view we had to decide what to do, should we turn off and head towards Strood station to catch the train back or carry on over the bridge and then walk into Rochester. With the wind blowing down the river the idea of being blown off the bridge didn't appeal and rather unfortunately we chose Strood. The Ordnance Survey map showed a path at the side of a railway line that would take out most of the road-walking so we went for that option. This footpath turned out to be very difficult to find at first, through a refuse tip and then at the side of a builders encampment before it was channelled along a fence between ' Digger World' and the railway. Digger World? Why? Lets take the kids to bulldoze a hill and wreck a few cars! After Digger World we had a dour depressing trading estate to pass through. Yet amazingly in the middle of all of the modern warehouse units stood an old Templars Palace built in the 13th century, it is amazing this has survived all the modern development, and in some ways it looks rather sad between row after row of warehouses. Finally we reached the station convinced that Strood is a close rival to Newhaven, which we went through on one of our South Downs day walks, for one of the worst places to visit on a walk, thankfully it didn't detract from what had been up to then an enjoyable day. 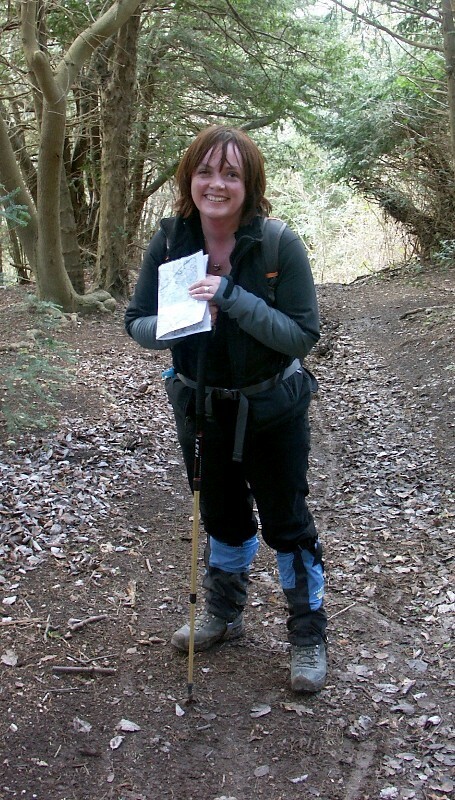 At the station, whilst I went to find the ticket machine, Liz was asked whether her trekking pole was a ski pole!!!!! Not sure where she would have found the snow on that day.